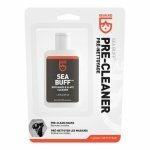 Before diving and snorkeling, clean masks with Sea Buff Pre-Cleaner. Cleaning dive masks is a recommended step prior to anti-fog treatment. Sea Buff’s quick-clean formula removes the silicone residue on new glass dive mask lenses. For older gear, it takes care of dirt, sunscreens, and algae that can interfere with anti-fog treatments. Just apply, rub, rinse and repeat. 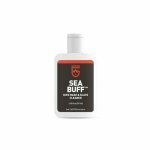 Keep dive masks clean and ready for anti-fog treatment with Sea Buff Pre-cleaner.